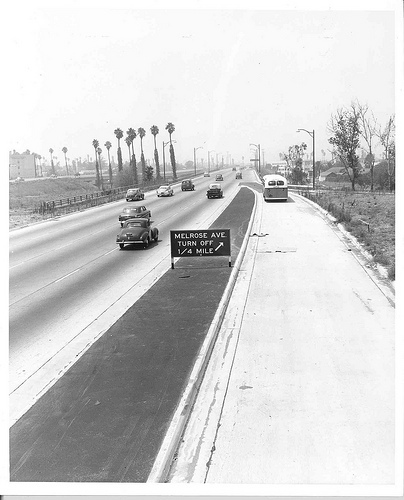 Hollywood Freeway with few cars and fewer buildings at Vermont. Okay, we know from the photo ID that this bus is coming in from a turnout at Vermont, heading west/north on a Hollywood Freeway shockingly free of cars and structures. What we don’t know is when. Anyone have a guess? (The cars should be a clue.) The only thing that looks familiar is the smog. See the original photo and many others on the Metro Library and Archive Flickr site.